The Municipal Art Commission - a commission dedicated to securing better cleaning and lighting for public streets and sought to influence the design of public buildings – recommended that the city employ Charles Robinson to lay out a plan for beautifying Los Angeles in 1906. Robinson was a writer and journalist, but was brought in to make recommendations. Not all of his ideas came to fruition however. 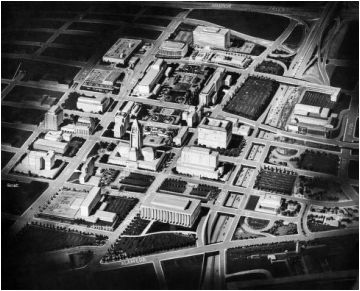 The Robinson Plan was primarily devoted to the aesthetic phases of city planning, but also provided for widened streets to relieve the traffic congestion in downtown LA and recommended the present location of the Civic Center. The mayor and the city council wanted to develop a comprehensive plan for Los Angeles that considers the needs of the city itself, so they established the City Planning Committee in 1910. This committee, however, did not accomplish anything because they did not have adequate funds and faced a great deal of contestation. City planning in Los Angeles had begun to become a movement, and city officials recognized the need to develop an effective comprehensive plan. 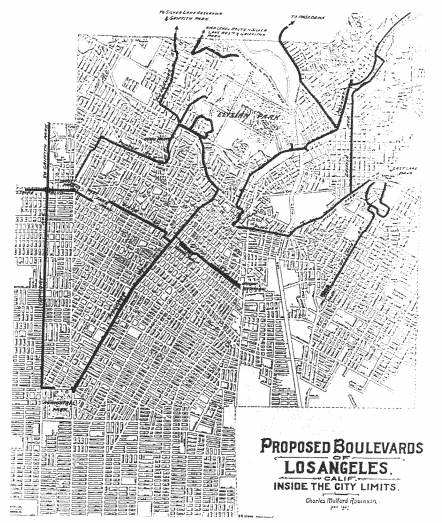 In consideration of what planning for Los Angeles would benefit the city in the future, reformers to the previous endeavors (The Robinson Plan and the City Planning Committee) concluded that public officials should assume additional responsibility to oversee and supplement private enterprise in order to shape the landscape of Los Angeles. This idea was the foundation for city and regional planning and helped bring about the development of the City Planning Association in 1915. This association was comprised of volunteers and was influential through its personnel. It promoted planning until 1920 when the City Planning Commission was established. This was the city’s first commission, comprised of 51 members with overlapping three year terms composed of representatives from 17 business and civic groups. This commission immediately assumed the responsibility for the physical development of the city, and began. A new Comprehensive Zoning Ordinance was established in 1946 and intended to zone all areas of Los Angeles, monitor zoning so that past mistakes are not repeated, and insure the elimination of nonconforming buildings in residential zones. The purpose of this zoning plan was to better control the land-use of the expanding population. This expanding population especially hit a boom in the years after World War II, and as a result there was a housing shortage. To address this shortage, the city created the Master Plan of Housing in 1945. To address blight in Los Angeles, the Community Redevelopment Act was established to redevelop these areas. This first comprehensive plan serves as the basis of continued planning of the City of Los Angeles today. In 1970, the Department of City Planning released its Concepts of Los Angeles General Plan (Concepts for Los Angeles)(Figure 3) for restructuring Los Angeles’ city form and serve as the city’s framework for the next long-range general plan. This plan was designed to help the city meet needs based on projections of increases in population. The plan drew on four general concepts: Centers, Dispersed, Corridors, and Low Density. This document focused on housing density options, spatial structure, transportation framework, and open space network as the policy variables. The document analyzed how all of these variables interacted with each other. The “Centers” concept entails an emphasis n both single-family and high-density housing. It is intended to develop a highly urban city in character while also leaving the single-family lifestyle character of the city an option as well. The “Dispersed” concept’s main focus is on single-family and low- and medium density housing. The “Corridors” concept focuses mainly on medium-density corridors that are developing out from the core. The Concepts for Los Angeles emphasized the importance of single-family housing. The Centers Concept proposed a network of 29 centers within the city that would vary in size. These centers would contain a core that would be near transit stations to promote transit transportation. These concepts also promoted a network of mostly small-scale open spaces as well. Many plans were never implemented however. But ideas such as the emphasis of development near transit stations served as a model for current transit oriented developments. Sloane, D. (2012). Planning Los Angeles. Chicago: American Planning Association. Coast, 1890-1920. Columbus: Ohio State University Press.